Home » updates » World Wide SketchCrawl 21 announced!!! I’ll be sketching that day in Skibbereen, in West Cork, Ireland. A small town in the depths of the Irish countryside. Should be in Bhimavaram, a town in coastal Andhra Pradesh, India. It will be snowing in my area so I am planning a “homebound sketchcrawl.” It will still be really fun though. I am in Western Massachusetts, USA. 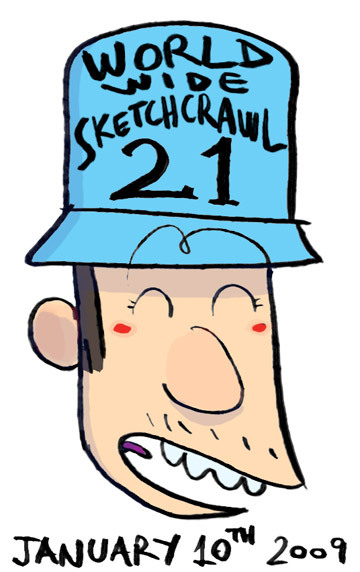 Can you please put the date of the next sketchcrawl on the homepage? The “10 days, 11 hours…” is nice, but the actual date is impossible to find! Thanks! Hi, Just understand that the next one is 21st November! I want to know the exact location where it is going to take place in Bangalore!? After we saw your message (a few years ago) we updated the homepage to also include both the date and the countdown. The recent website update now includes a calendar to make it even easier.